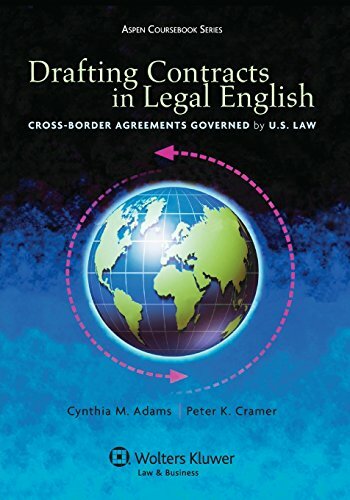 Written in a deliberate and concise manner, devoid of United States colloquialisms, Drafting Contracts in Legal English: Cross-border Agreements Governed by U.S. Law is designed for classroom use as well as self-study. Teaching a strategic approach and sequential steps to drafting contracts, the text includes examples and exercises based on cross-border agreements such as distribution agreements, licensing, franchises and equipment leases. Special drafting issues in cross-border agreements are also considered: choice of language clauses, choice of forum clauses, indemnification provisions, force majeure clauses, counterpart clauses, international alternative dispute resolution clauses, and the choice to opt in or out of the CISG. By providing appropriate explanations of United States law, the text increases student comprehension as suggested drafting approaches are placed in legal context. This unique guide discusses the purpose of and provides drafting tips for contract parts, contract organization and formatting, basic contract provisions, letters of intent, and the craft of reviewing and revising contracts. End-of-chapter exercises test overall comprehension and apply drafting concepts presented in the chapter. To increase the non-native speakers lexical range, vocabulary is derived from a statistical analysis of thousands of authentic contracts. To help with contract sentence structures that are challenging for non-native speakers, syntax structures are based on comparison to databases with authentic contracts. A glossary of contract terms is based on frequency counts from thousands of authentic contracts and usage in text, contextualized and cross-referenced with most common collocations. If you have any questions about this product by Aspen Publishers, Inc., contact us by completing and submitting the form below. If you are looking for a specif part number, please include it with your message.